Marketing on Twitter can be very effective for your business. But the trick is to follow some steps to avoid spamming. If you keep spamming your followers will stop following you. Keeping your followers informed of your latest updates is important so use those 140 characters in a way that won’t seem forceful or a spam. To get a maximum effect on your business through Twitter is to follow a few steps that will boost your business. Sign up for a twitter account and use your real name as the user name instead of business name. This helps build creditability. Start by following the people you know. You can send as many tweets as you want but every tweet is limited to 140 characters. Twitter also lets you post links which is a great way to let your followers know about your website and promotions. If you twitter a few times a day, promote your business once or twice between ten or fifteen tweets. Don’t use your links every time you send a tweet. Do some @whoever replies to the people you follow. That way when they reply, other people might see it and there’s a chance they’ll follow you too. Use tinyurl.com link to have more free space for what you have to say in your tweet. Tweet about topics that you think your customers will be interested in. If they like your tweets they’ll “retweet” your message and you’ll have a more chance of increasing your customers. 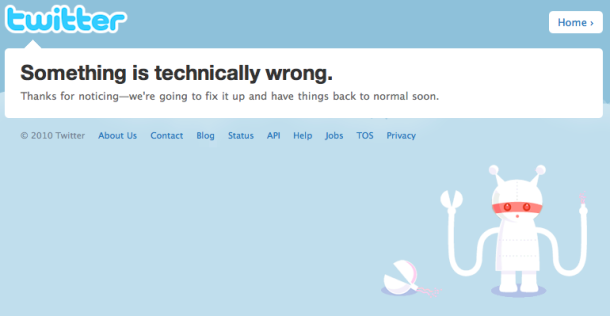 Tonight if you haven’t noticed already Twitter is down. It’s up for about 2 seconds then Twitter crashes once again. The issue started at 8:00 PM and continues until now (Almost 12:00 AM). The problem according to a twitter spokesman, “Our infrastructure and operations engineers are currently working to resolve this. The site could be down until approximately 3 a.m. PDT,” company spokeswoman Carolyn Penner said (http://news.cnet.com/8301-30685_3-20007714-264.html).” Right now I’m checking Twitter and getting an “Internal Server Error.” I guess I’m just have to wait until it’s resolved. The Only People Worth Following on Twitter! Comments Off on The Only People Worth Following on Twitter! You like to Twitter? If you are serious about getting the best information on your Twitter account you need to sign up with these people. If you subscribe to all these people you will be getting a lot of Tweets so do yourself a favor download TweetDeck already! If you have any suggestions please leave a comment and if you haven’t already subscribe now! Make money the easy way… whenever something is new that’s when you want to take advantage of it and profit off it. In the Internet world find ways to monetize new services as FAST AS YOU CAN because within a month or two you’ll be too late. In March Twitter traffic doubled. Now is the time! That’s where TweetPub.com comes in. Just visit TweetPub, sign up for an advertising account, and start blasting off things called “Premium Tweets”to your Tweet subscriber base. Basically a premium tweet is something a user of TweetPub subscribes to paying a monthly fee to receive. Basically you are monetizing your private Twitter feed trough TweetPub.com. You have to make sure that info is worth the price! Here is a list of people who can save you money by following their profiles on Twitter.com. They will Tweet current coupon codes.